There’s been a lot of talk the last few days about two articles in Aftonbladet and Internetworld regarding how many Swedish blogs that currently exist. Since I started to do some research in the matter about a week ago, I might as well give you my two cents. #1: This would give BlogSoft, Passagen and MSN Spaces a market share of 91 per cent which I find completely impossible to believe. #2: Roland at BlogSoft told me in an email a few days before these articles appeared that BlogSoft has 9,600 registered accounts and that 1,500 to 2,500 can be defined as real bloggers, depending on definition. Henrik Torstensson states that BlogSoft is supposed to host about 3,500 blogs, unclear where this figure comes from. So, a qualified guess is that BlogSoft hosts some 3,000 to 3,500 blogs and has about 6,000 registered users that are in the process of setting up a blog, but haven’t yet begun posting. #3: One of the most popular blog portals is Nyligen.se which tracks recently updated Swedish blogs. To be included in the portal you must actively submit an application. By checking the id numbers of each individual blog at Nyligen.se we can assume that more than 3,500 blogs are members of the portal, so it should be fairly representative of the Swedish blogosphere. I checked about 230 random blogs at Nyligen.se and can conclude that BlogSoft (blogg.se and webblogg.se) is nowhere near half the market, or a third for that matter. What I found was that 8 out of 10 Swedish blogs either use a personal domain name (can also include the address to a personal webpage hosted by their ISP, like Telia) or are hosted by Blogspot. About 1 out of 10 is hosted by BlogSoft. We can guess that new blogs at Passagen and MSN Spaces (and possibly blogg.se and webblogg.se) are not as accustomed yet to the practice of pinging posts to a portal, and therefore are mis-represented in the stats above. Now assume that the market share for BlogSoft is closer to 10 per cent or let’s say 15 per cent due to the mis-representation noted above, and that the number of hosted blogs are in the vicinity of 3,500 to choose an even number (that is also supported by Torstensson). 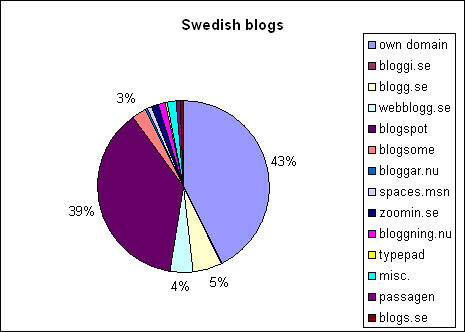 That would give us a suggested total number of Swedish blogs to between 23,000 and 25,000. The relation between BlogSoft, MSN Spaces and Passagen doesn’t seem to be that far off the mark, so I needed to assume that the number of blogs at Blogspot and blogs with their own domain name are not 80 per cent, rather closer to 50 per cent. Of course, this whole arithmetical example is based on a series of half-guesses and wild assumptions, so consume it with a healthy dose of scepticism. And I am well aware of the difference between a blog software like Blogger, Blogsoft or Typepad and the actual domain name of a blog. But I don’t think it is more wrong than Internetworld and Aftonbladet. I would love to read other bloggers’ thoughts on the matter. Am I a crackpot or are we getting closer to a figure we can agree on? Footnote: Nyligen.se only lists 1,500 blogs on the website, but I understand that blogs that have not sent a ping in two months are not visible, which further mis-represents “inexperienced bloggers”, like bloggers that don’t use a personal domain for example.